Chewbacca is one of those characters that even none Star Wars fans can recognise, the walking carpet, fireball, fuzzball and companion to that scruffy nerf herder Han Solo, and he is finally available for Fantasy Flight Games excellent Star Wars Legion. Hailing from the lush forest world of Kashyyyk, a member of the extremely long-lived race Wookiees, Chewbacca is a legend among his own people, fighting alongside the Republic during the Clone Wars, siding with the underdog Rebel Alliance against the Empire and later with the New Republic Resistance against the New Order! He is a skilled pilot and has acted as co-pilot of the legendary Corellian YT1300 stock light freighter the Millennium Falcon, alongside his friend Han Solo.for many decades. Chewie is also a very skilled technician and has a great mechanical aptitude for fixing almost anything from a faulty power conductor to a protocol droid! He is loyal to those in his circle of trust, quick-tempered but has a good heart! Just don’t let him lose at games of chance, especially if you are a droid who likes to keep all of your limbs intact! 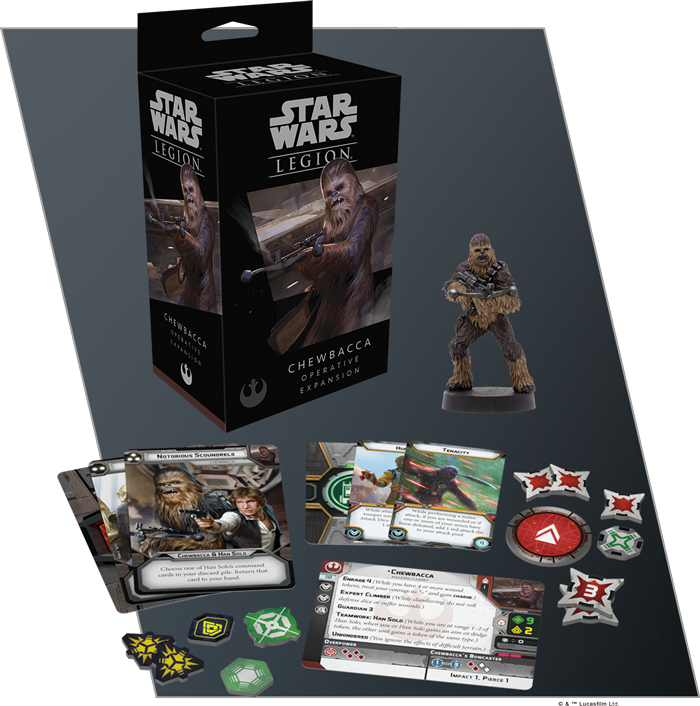 One of the biggest single miniatures in the range, Chewbacca or Chewie to his friends has the Operative keyword which allows him to act as a secondary commander of sorts in your force, and gives him three command cards, each of which features a member of his extended human family Luke Skywalker, Leia Organa and Han Solo! These command cards give boosts to the other heroes. If fielded with Leia he can use the Brains and Brawn command card which allows Chewie to add to Leia’s dice pool if he isn’t already engaged. 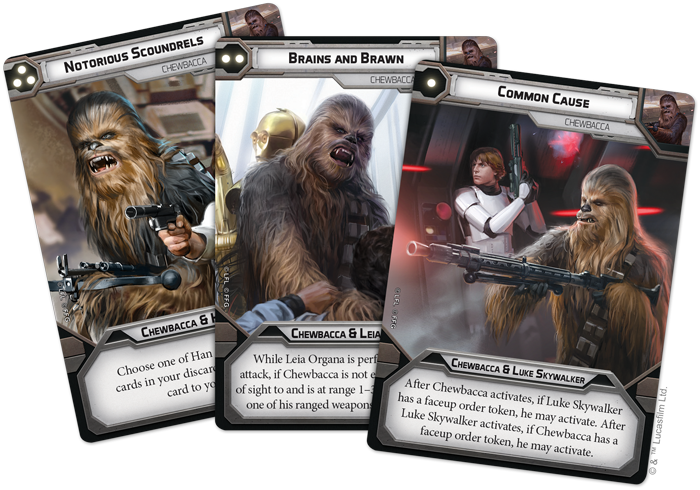 The Common Cause command card can allow Chewbacca to activate at the same time as Luke Skywalker if they both have face up order tokens. Finally, the Notorious Scoundrels command card allows Han Solo to choose a card from his discard pile and return it to your hand. Stat wise Chewie could easily go toe to toe with Darth Vader, with massive health of 9 points and his Bowcaster is pretty handy with two red and two white dice and a range of 1-3, and Impact 1, Pierce 1! 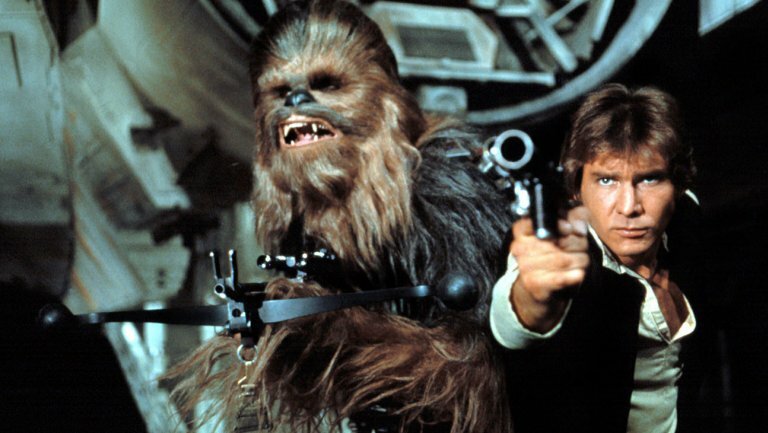 His teamwork ability is used when played with Han Solo and gives Chewbacca or Han either an Aim or Dodge the other character gains the same token! This can be pretty useful and in the right moment turn the tide of battle and really will reflect how in synch the characters are with each other.